Internationally renowned British Artist, Gavin Turk, has designed a fleet of colourful, striped bicycles inspired by his work around mobile art and has organised a cycle ride for the public taking in a selection of Cambridge’s public sculptures. During the ticketed event, the artist will stop to reflect on each work, encouraging the participants to engage in conversation about the art. The three guided bicycle rides for the local community will take place on 10th and 24th June, and 8th July, and will be curated and led by Gavin in partnership with Brookgate. These rides will encourage Cambridge to see the public art that surrounds us every day with fresh eyes, and by joining the ride, you will be participating in a mobile art event. 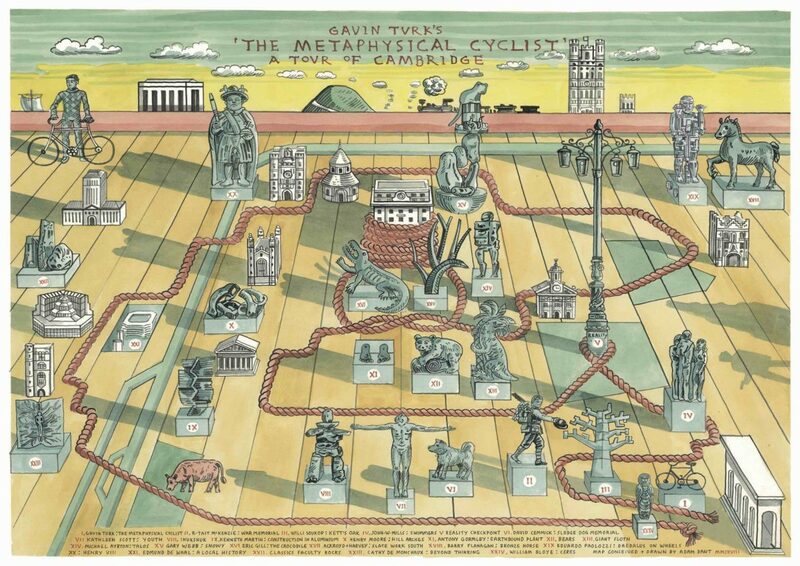 Cambridge-born artist Adam Dant has drawn a map of the route, which is also available for cyclists to follow in their own time after the official rides led by Gavin. This initiative has come about as a result of the developer Brookgate’s commitment to investing in culture along with the ongoing delivery of the CB1 development and is the first in the partnership between Gavin and Brookgate. The initiative also includes a commission for a new sculpture for Station Square in the future. To get your hands on one of the limited number of FREE tickets for the rides, please book on the Eventbrite page.